As part of the Hacking Voter Suppression 2018-2019 Magic Grant, Columbia Journalism School Professor June Cross and Charlotte Braithwaite, a Theater Director and Assistant Professor of Music and Theater Arts at MIT, will host Casting the Vote, An American Dinner Party. The event will take place on April 11, 12 & 13 at the MIT W97 Theater (345 Vassar St. Cambridge). The event will be first come, first served. Everything happens at dinner: friends meet families, communities see themselves for the first time, solidarity is discovered, hunger is satisfied. Passing the salt, filling the water glass, and second helpings – there, laid bare, is the subtle integrity of human beings being together. Our American stories, our mythologies, our activism are written at the table between courses – but lately, we seem to eating alone. You are invited to a very special dinner party – back to the table, the drawing board, the stage – back to eye contact. We have something to talk about, something as American as family dinner: the right to vote. 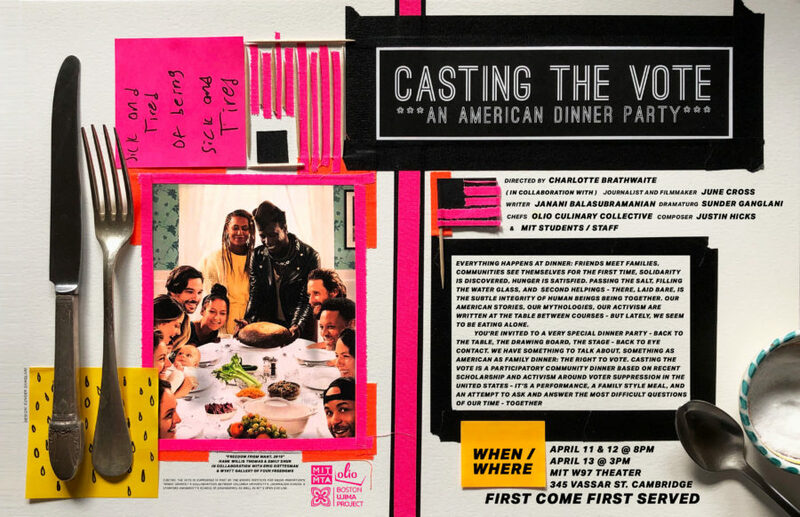 Casting the vote is a participatory community dinner based on recent scholarship and activism around voter suppression in the United States – it’s a performance, a family style meal, and an attempt to ask and answer the most difficult questions of our time – together.